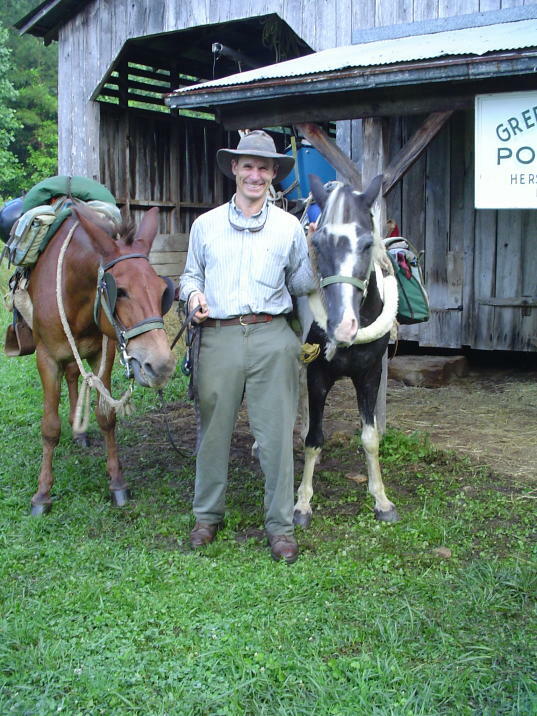 Bernie Harberts and his mule, Woody, set out from North Carolina and are heading westwards. Bernie Harberts and his mule set out in the Spring and headed west. They were later joined by Magnolia, the pack-pony, and have just crossed the Mississippi. Bernie set out his plans in an email to The Long Riders' Guild some months ago: he told us he had sold the old boat he sailed single-handedly around the world and had struck off on a mule. "I've swapped the old postage stamp racing saddle I used to ride steeplechase in for an old McClellan and a pile of first class wool blankets. The fancy ring bits and tongue ties are gone too, swapped for a loose ring snaffle and a small green saddle bag. We're going quietly; no sponsors, no cell phone, no pack horse. Just Woody and I with pencil, paper, and coffee. I'm heading out of nearby Oriental (on the North Carolina coast) because once in every life a mule should see the sea. Then it's off West across the state with spring and we'll see what happens next." "I now have a pack pony. She's black and white with one white eye and the other brown. Her name's Magnolia. Her name used to be "7" because there's a white seven on her forehead. Yeah, other guys have horses with blazes, stars, and snips on their foreheads. Nope, not us. We've gotta have a pack pony with a digit on its face. Still, she lends our troupe a feminine, albeit asymmetrical air and that's appreciated." "Woody, Magnolia and I crossed the Mississippi River last Saturday. We're now in McCrory, Arkansas (pop 1,868) where the highest point in town is the grain elevator (rice, soybeans, corn) and the coolest beer's on tap down at the Mule Barn ($1.50 per mug). I like this place. 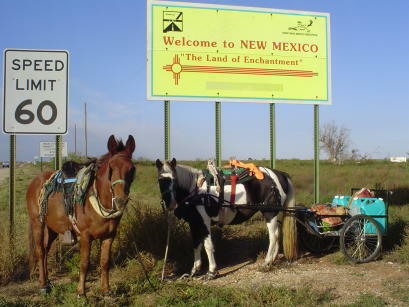 Woody the mule and Magnolia have settled for Pioneer corn and two days off along the Cache River." Bernie has emailed to let us know that he and Woody have now travelled for a thousand miles. Welcome to The Guild, Bernie! "It's been seven and a half months on the road now with almost two thousand mules under the old keel. Life in the old McClellan agrees with me so I aim to stretch out the trip a few more months in the Arizona desert and then it's on to the pacific Ocean. The only problem, just like it was on my old sailboat Sea Bird, is water. But like then, it's nothing a few jerry jugs can't fix." "To that end, friends I met in Texas helped me clobber together a small two-wheeled cart for my pack pony Magnolia. I can load four "Desert Command" jerry cans of water aboard, a bag of Purina feed and still have room for my tipi. Ah, the luxury." The photo on the left shows the Custom Pack Rigging pack saddle re-rigged for pulling Magnolia's cart. "I discovered that a piece of discarded Gates radiator hose (#ECR21275) screwed to the inside of the Easy Boots eliminates all chafe. I also cut a mud flap off an eighteen-wheeler into hoof-sized pieces. When the boots get worn too thin, I push those things into the bottom of the boots and get a few more miles down the road. 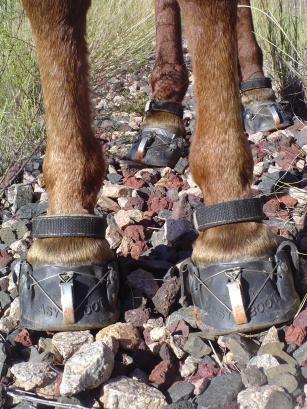 Most all those boots have at least 1000 miles on them now." Click on either photograph to enlarge it.